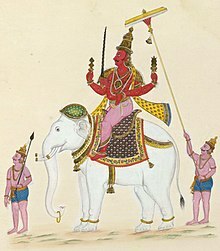 Pentin o Indra on his elephant moont, Airavata. Indra (Sanskrit: इन्द्र) is a Vedic deity in Hinduism, a guardian deity in Buddhism, an the keeng o first heiven cried Saudharmakalpa in Jainism. ↑ Helen Josephine Baroni (2002). The Illustrated Encyclopedia of Zen Buddhism. The Rosen Publishing Group. p. 153. ISBN 978-0-8239-2240-6. This page wis last eeditit on 20 Julie 2017, at 17:26.